Heat oven to 350°F (325°F for dark or nonstick pans). Make and cool cupcakes as directed on box for 24 cupcakes. Tint frosting with red and yellow food colors to make orange frosting. Spread frosting over tops of cupcakes. Squeeze circles of decorating gel on each cupcake; pull knife through gel from center outward to make web. To make each spider, roll out 1 gumdrop and cut out 8 strips for legs; place another gumdrop on top. 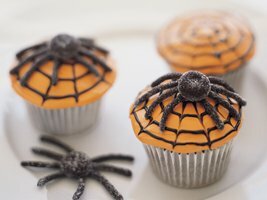 Place spider on cupcake. Store loosely covered at room temperature. Yum! Now to find out how to make this "fructose free" since we just found out our oldest son is malabsorping fructose.